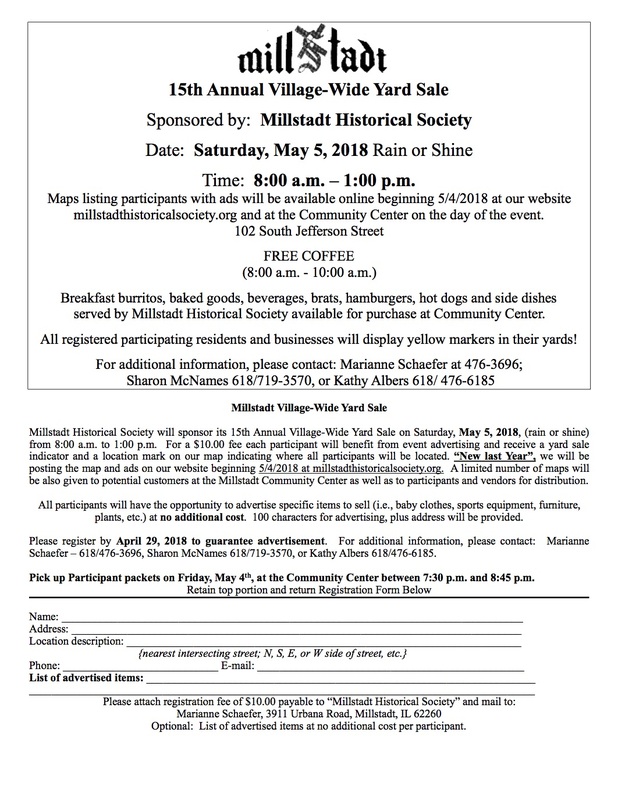 Millstadt Historical Society will sponsor its 15th Annual Village-Wide Yard Sale on Saturday, May 5, 2018, (rain or shine) from 8:00 a.m. to 1:00 p.m. For a $10.00 fee each participant will benefit from event advertising and receive a yard sale indicator and a location mark on our map indicating where all participants will be located. “New last Year”, we will be posting the map and ads on our website beginning 5/4/2018 at millstadthistoricalsociety.org. A limited number of maps will be also given to potential customers at the Millstadt Community Center as well as to participants and vendors for distribution. All participants will have the opportunity to advertise specific items to sell (i.e., baby clothes, sports equipment, furniture, plants, etc.) at no additional cost. 100 characters for advertising, plus address will be provided. Please register by April 29, 2018 to guarantee advertisement. For additional information, please contact: Marianne Schaefer – 618/476-3696, Sharon McNames 618/719-3570, or Kathy Albers 618/476-6185. Pick up Participant packets on Friday, May 4th, at the Community Center between 7:30 p.m. and 8:45 p.m.